Luxurious sofa throw or cuddle blanket, the ultimate winter warmer. 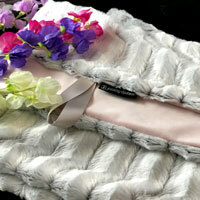 These sumptuous blankets have the softest faux-fur on one side and an exquisitely soft velvet on the other. Complete with a satin ribbon hanging loop, they make a fabulous gift or a special treat for chilly winter evenings. Very happy to design to order, if you would like one made in a specific colour or size, please message me for a quote. 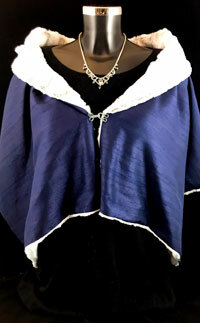 I have used exquisitely soft faux-fur to line this vibrant wrap in Dupion silk. A dream to wear and perfect all year round for keeping shoulders snug when the need arises. You'll never want to take it off! One size fits most. Very happy to design to order, if you would like one made to a specific size or colour, a longer one or maybe a child's one, please message me for a quote. 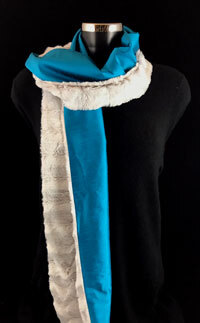 Hand-made from ultra soft-feel faux-fur and the rich tones of Dupion Silk, these scarves are deliciously soft and cuddly. Perfect for keeping out the draughts on a chilly walk or adding a brilliant splash of colour to your favourite outfit. Very happy to design to order, if you would like one made in a specific colour, please message me for a quote.